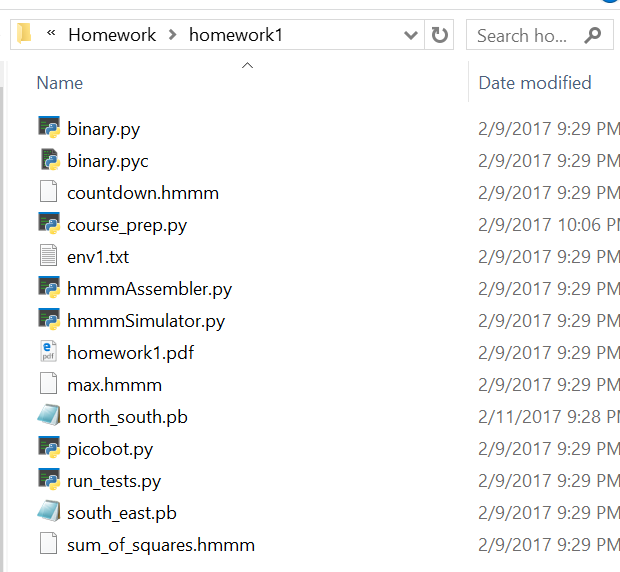 "$ python picobot .py -e env1 . txt -b "10 , 10" < north_south .pb"
python picobot.py -e env1.txt -b "10 , 10" < north_south.pb"
# Each cell in the environment can be one of the following. s += "N" if env[brow - 1][bcol] == WALL else "X"
s += "E" if env[brow][bcol + 1] == WALL else "X"
s += "W" if env[brow][bcol - 1] == WALL else "X"
s += "S" if env[brow + 1][bcol] == WALL else "X"
and neighborhood. Otherwise, return None. symbol. For example, N*WS yields NEWS and NXWS. # Create the environment for the bot. # Initialize starting cell for the bot. # Check for repeat rules.